Preston Monroe has released iCopy, a Safari bookmarklet that will copy text from a web page and paste it into another web page. (Actually, he uses an intervening step so the process is actually copy, paste, paste). That's a good start, but what if you want to copy text from a file on your Touch to a website, or vice-versa? Well, I've written a solution for that: localCopyPaste, available from my .Mac public folder as localCopyPaste.zip. Here's how to install and use it. I'll assume you have some basic command-line skills, so please don't write me asking how to change directories or open a Terminal session. If that's beyond you, you'll probably find the installation and usage to be too inconvenient anyway. With that said, here goes. Install Python, wget, OpenSSH, Terminal (Term-vt100) from Cydia. Optionally install 1.1.3/4 Safari patch to allow you to open files on your Touch using Safari. On your desktop, install Putty (for Windows). If using a Mac or Linux, you already have ssh. Connect to your Touch (or iPhone) after determining its IP address (check Setting > Wireless > name of network you're connected to). Let's assume it's 192.168.0.94. To connect, type "ssh -l root 192.168.0.94", then log in with the appropriate password (default is 'alpine'). Switch to your Documents folder: "cd /User/Media/Documents" (or any other preferred location). Install the web.py web application framework: "easy_install web.py". This should fetch it from python.org and install it. 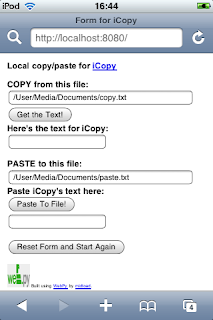 Now unzip localCopyPaste.zip on your desktop and copy over to your Touch's /User/Media/Documents folder. On the Mac, you can use Finder to do this, after using 'Connect to Server' and specifying 'afp://192.168.0.94' as the desired location; or, you can use Fugu and its built-in SCP tool. On Windows, use the excellent WinSCP application for this. Go back to your SSH client and make the copypaste.sh and killcopypaste.sh files executable with "chmod 0755 *.sh"
Now you will start a local webserver on port 8080 serving up a special page so that iCopy can copy from it or paste to it: in your SSH window, type "./copypaste.sh". If all goes well, after a second or two you should see "running with PID 21644" (or some other process number). Then you will see a second line "http://0.0.0.0:8080/" which indicates that the webserver is accepting local connections on port 8080. Press Enter to get your command prompt back. You can now close your SSH window and break the connection between the desktop and the Touch. If you get an error spew ending with "socket.error: socket already in use", this means that you have tried to start a second copy of the webserver, or another webserver is running on that port. If you want to stop the local webserver later, either open another SSH connection to the Touch, or open a local Terminal session on the Touch, and go back to the installation directory. Type "./killcopypaste.sh". Put the text you want to copy into a local file in /User/Media/Documents. By default, the local copy websersver will look for a file called copy.txt in this folder. Similarly, the webserver will place pasted text into a file called paste.txt in this folder. Now use iCopy to copy text from a website to your Touch (by default, into paste.txt), or to copy text from copy.txt on your Touch and then paste it to some remote website. Remember that iCopy requires you to Copy - Paste - Paste. I did all my testing on my Touch while it was connected to my desktop PC or Mac via SSH. And I started my web application through that SSH connection. I've discovered that as soon as I break the SSH connection, the web application stops. That's no good! One solution is to start and stop the app through the BossPrefs utility, as it's used for a number of other server services. I'm still working on that and should have something in a few days.